This article was first published in the December 2018 edition of Drug and Alcohol Research Connections. Co-occurring mental health and substance use disorders are common, are harmful to people’s wellbeing and social functioning, and are associated with disproportionately high costs to healthcare systems 1-9. The prevalence of co-occurring disorders in mental health (MH) and Alcohol and other Drug (AoD) treatment settings is sufficiently high that they are described as an ‘expectation rather than an exception’ 3. There has been rapid development of psychosocial interventions for co-occurring disorders in recent years and valuable insights have been identified and built into clinical guidelines and into services’ redesign processes 9-15. 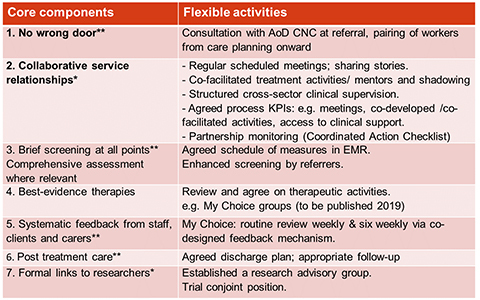 As a result, an integrated care approach (coordinated treatment of both MH and AoD conditions by clinicians or services working together) is recommended as best practice because it more consistently results in better outcomes than approaches that treat these conditions separately 10,11,16-18. Despite the benefits of integrated care, such as reduced symptom severity and fewer acute-care admissions for people who have co-occurring disorders, most MH and AoD services operate independently of each other. This is problematic given that neither recognition of the need for improved clinical services nor the identification of integrated care as the preferred treatment approach (in clinical guidelines in multiple countries), has been enough to achieve meaningful and sustained change in the delivery of integrated care 3,6,8,15. Reports estimate that less than 12% of people with co-occurring disorders receive treatment for both conditions 15,19. Consistent with the research evidence, clinicians at the North Coast Mental Health Rehabilitation Unit, MNCLHD and the Coffs Harbour Drug and Alcohol Service, MNCLHD identified that up to 70% of residents of the rehabilitation unit had substance use disorders, but less than 10% of those consumers took up referral to the AoD service following discharge from the rehabilitation unit. To increase the number of people receiving AoD treatment, clinicians formed a working group to collaboratively adapt their clinical practices to be more inclusive and accessible to consumers. A research advisory group was established to provide evaluation support and to ensure practice changes were aligned with research evidence. Members included key managers and clinicians, plus representatives from the National Drug and Alcohol Research Centre, the Centre for Rural and Remote Mental Health and the Mental Health and Drug and Alcohol Office. The research described in this article sought to address a key knowledge gap by working in partnership with service providers, consumers and researchers to enhance collaboration between separate MH and AoD services and improve the delivery of care for people who have co-occurring disorders. Why is integrated care not widely provided as routine care? There are at least two possible reasons for the lack of sustained uptake of integrated care into routine practice. First, what appears to be missing is a widely-accepted service-delivery model that both adequately reflects best-evidence practice and has the capacity to be tailored to the individual circumstances of different service providers and consumers. Second, it may be that the uptake of integrated care is not being guided by the application of a feasible, acceptable and relevant model of change with which service managers, clinicians and consumers can engage in a meaningful way . The availability of a practical, evidence-based framework to guide services to drive the uptake of IC through the complex transition process. This study had two aims. First, to co-design and co-implement an evidence-based model of integrated care that could be tailored to multiple services. Second, to construct a pragmatic process for guiding uptake of that model into routine practice. A mixed-methods approach using Participatory Action Research was implemented in a 20 bed non-acute residential rehabilitation unit for people aged 18 years and over who have been diagnosed with a major mental illness; and an outpatient AoD service for people aged 14 years and over. Participatory Action Research was chosen because it facilitates co-design: a ‘process of collaborative creativity’ in which ideas and thoughts are shared to develop a new product and collectively ‘create new value’ 20. Fifty-six clinicians, five external researchers and ninety-one residents of the rehabilitation unit participated in meetings, surveys or focus groups over four years. Four cycles of participatory action research were enacted, where existing processes were reviewed, adapted, trialled and adapted again as necessary. Together, participants devised solutions to barriers, and designed logos and posters, manuals and handbooks, and an animated video to introduce newly designed therapeutic groups to consumers. Qualitative and observational data were analysed for emergent themes and self-reported quantitative data were scored on Likert scales. 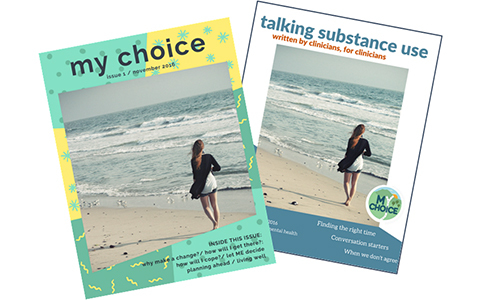 Booklets designed by clinicians and consumers as handbooks for clinicians and consumers. 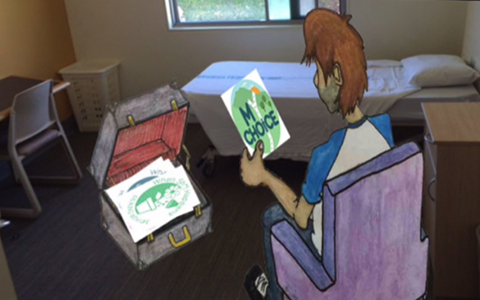 A still from a video created by clinicians and played for clients to introduce co-facilitated theraputic group sessions (credit: Dan van der Donk). Constructing the model and the framework. Previous studies used logic models to develop treatment frameworks that comprise core components that are evidence-based and are standardised across settings, and flexible activities that are tailored to individual services to operationalise the core components 21-24. This strategy was applied to the development of the service delivery model and the framework described in this article. It is an iterative approach that enables the development of best-evidence models of care that are comparable across different services (the core components) with built-in flexibility to accommodate services’ contexts and preferences (the tailored activities) 23. A key finding was the importance of embedding a process for monitoring and responding to levels of participation. Engaging staff and consumers in driving their own change process was critical to empowering them to actively lead and achieve change rather than to feel threatened by it. In addition to simply participating in the process, however, the nature of involvement was key. Consistent with Arnstein’s (1969) Ladder of Participation, there was a clear differentiation between seeking input (which can be perceived as tokenistic) and securing active participation (where participants have power to make decisions) 25. Higher levels of control in the change process equate to higher likelihood of achieving change. “…It’s about being asked for input at the beginning of something and to be part of implementing it. I feel like my opinions are being taken seriously and are actually being used.” Norah*, clinician focus group. “I feel like it’s a really good environment, you know? I like having an opinion and a say in what happens…it’s helped me a lot”. Harry*, consumer focus group. In contrast, top-down approaches where decisions are imposed, can increase resistance because they are viewed as ‘empty and frustrating’25. The trick, however, is finding the right balance. While bottom-up leadership was key to achieving buy-in and sustainability at a workforce level, top-down leadership was crucial to ensuring relevance and feasibility at an operational level. Clinicians were also unlikely to participate without visible support from their managers. The Ladder of Participation offers one explanation for the difficulty of achieving effective and sustainable change in clinical settings. That is, participation at all organisational levels is critical, but insufficient attention to the nature and level of that participation prevents the necessary distribution of power between managers, clinicians and consumers to effect real change. An agreed, evidence-based service-delivery model and a pragmatic implementation framework were developed (see excerpts, Tables 1 and 2). Involving both a wide range of staff of clinical services and researchers ensured the service-delivery model would represent evidence-based practice by combining the best available research evidence (researchers) with the expertise of service providers and consumers 26. Involving staff from two previously independent service systems (i.e. MH and AoD) encouraged greater alignment between the treatment provided in those systems, and ensured changes were feasible for clinicians to implement. Involving consumers in the development and implementation of the service-delivery model ensured that it would be highly acceptable to consumers and would be more likely to improve the quality of the care that they receive, whilst also upholding their rights to influence and inform the services that are designed to meet their needs27. Table 1. The service delivery model. This is an excerpt from the service-delivery model which is expected to be published in early 2019. Note. All core components are drawn from clinical guidelines. 1 x asterisk = also identified by clinicians, and 2 x asterisks = also identified by clinicians and by consumers. Ideally, both the model and the framework will now be applied and evaluated in multiple settings and in different countries so that a useful evidence base can be established for the implementation of standardised but adaptable integrated care. Services and policy makers can utilise the model and the framework to increase the uptake of integrated care internationally, or for improved utilisation of the comprehensive range of integrated resources that already exist. Table 2. The implementation framework. This is an excerpt from the implementation framework which is expected to be published in early 2019. The sustained uptake of integrated care (or any clinical innovation) is likely to require active participation from frontline staff and consumers, and a practical and feasible systems-change approach to guide the transition process. Attempting to integrate AoD and MH care is a global challenge, but models to facilitate this broader dissemination are most likely to be effective if they emanate from locally driven services, and from resolving real-world problems. A key strength of the service-delivery model and the framework developed here is the standardised but flexible nature of the core components. They provide one possible solution to the challenge of translating integrated care into practice across multiple settings. 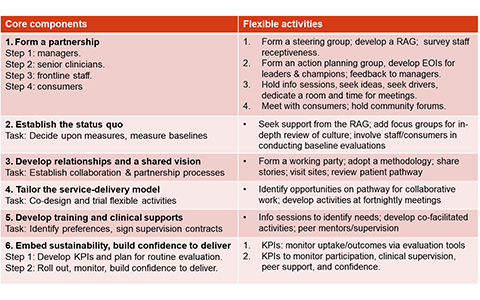 This pragmatic, clinician-led approach could also be applicable to other services where consumers would benefit from a collaborative approach to care. Catherine is a psychologist with a clinical background in substance use, mental health and trauma. She has recently completed her PhD with NDARC, UNSW, and is extending on the work presented here in partnership with NDARC and the Mid North Coast Local Health District. The research on which the article is based was made possible through a collaborative partnership between NDARC and the Mid North Coast Local Health District Mental Health and Drug & Alcohol Services. The author is grateful to the staff and consumers of the North Coast Mental Health Rehabilitation Unit and the Coffs Harbour Drug & Alcohol Service for sharing their time and insights so generously. Gratitude is also extended to NDARC, to HETI mentors (Kerith Duncanson, David Schmidt and Emma Webster) to the Mid North Coast management team for facilitating this endeavour, and to Catherine’s PhD supervision team (Prof Anthony Shakeshaft, Dr Julia Lappin, Dr Julaine Allan, Dr Ryan Courtney and Prof Michael Farrell) for their unwavering guidance and support. This research was funded by NDARC at UNSW through their post-graduate scholarship scheme. NDARC is supported by funding from the Australian Government under the Substance Misuse Prevention and Service Improvements Grants Fund and by infrastructure support from the UNSW, Australia. Funding and mentorship were also provided by the Health Education and Training Institute through their Rural Research Capacity Building Program. Drake, Bartels SJ, Teague GB, Noordsy DL, Clark RE. Treatment of substance abuse in severely mentally ill patients. Journal of Nervous and Mental Disease. 1993;181(10):6. Gerding et al. Alcohol dependence and hospitalization in schizophrenia. . Schiz Res. 1999;38:71-75. Mueser KT, Noordsy DL, Drake RE, Fox L. Integrated treatment for dual disorders. A guide to effective practice. New York, NY: The Guildford Press; 2003. Farrell et. al. Nicotine, alcohol and drug dependence and psychiatric comorbidity: results of a national household survey. Br J Psych.2001;179:432-437. Grant et.al. Prevalence and co-occurrence of substance use disorders and independent mood and anxiety disorders. Arch Gen Psych.2004;61:807-816. Allsop S, ed Drug use and mental health: Effective responses to co-occurring drug and mental health problems. Melbourne: IP Communications Pty Ltd; 2008. Drake E, Mueser K, Brunette M, McHugo G. A review of treatments for people with severe mental illnesses and co-occurring substance use disorders. Psychiatric Rehabilitation Journal. 2004;27:360-364. Baker A, Velleman R, eds. Clinical handbook of co-existing mental health and drug and alcohol problems. East Sussex: Routledge NSW Mental Health Commission; 2007. Croton G. Victorian Travelling Fellowship. Co-occurring mental health and substance use disorders: An investigation of service system modifications and initiatives designed to provide an integrated treatment response. Wangaratta, Victoria: Eastern Hume Dual Diagnosis Service; 12.04.04 2004. Marel C, Mills KL, Kingston R, et al. Guidelines on the management of cooccurring alcohol and other drug and mental health conditions in alcohol and other drug treatment settings In: Centre of Research Excellence in Mental Health and Substance Use NDaARC, University of New South Wales, ed. Sydney, Australia: Centre of Research Excellence in Mental Health and Substance Use, National Drug and Alcohol Research Centre, University of New South Wales;; 2016. NSW Department of Health. NSW Clinical Guidelines for the Care of Persons with Comorbid Mental Illness and Substance Use Disorders in Acute Care Settings In. Sydney, NSW: Department of Health; 2009. QLD Health. Changing Models of Care Framework. In:2000. Agency for Clinical Innovation A. Understanding the process to develop a Model of Care: An ACI Framework. 2013. https://www.aci.health.nsw.gov.au/__data/assets/pdf_file/0009/181935/HS13-034_Framework-DevelopMoC_D7.pdf. Deady M, Barrett E, Mills K, et al. Effective models of care for comorbid mental illness and illicit substance use: An Evidence Check review brokered by the Sax Institute (www.saxinstitute.org.au) for the NSW Mental Health and Drug and, SAX Institute, Sydney, http://www.saxinstitute.org.au/wp-content/uploads/Comorbid-mental-illness-and-illicit-substance-use.pdf;2015. Drake, O'Neal EL, Wallach MA. A systematic review of psychosocial research on psychosocial interventions for people wth co-occurring severe mental and substance use disorders Journal of Substance Abuse Treatment. 2008;34(1):16. Centre for Addiction and Mental Health. Best practices: Concurrent mental health and substance use disorders. In. Ottawa, ON: Health Canada;; 2002. Kleber H, Weiss R, ANTON R, et al. Practice guideline for the treatment of patients with substance use disorders. American Journal of Psychiatry.2007;164:5-123. Department of Health (England) and the Devolved Administrations. Drug misuse and dependence: UK guidelines on clinical management. In: Administrations DoHEatD, ed. London: Department of Health (England), the Scottish Government, Welsh Assembly Government and Northern Ireland Executive 2007. Epstein J, Barker P, Vorburger M, Murtha C. Serious mental illness and its co-occurrence with substance use, 2002. In: Studies OoA, ed. Rockville, MD. : Substance Abuse and Mental Health Services Administration; 2004. Thallmaier S, Habicht H. Challenges of Customer Co-Design. Germany: Springer Gabler; 2013. Knight A, Maple M, Shakeshaft A, Shakeshaft B, Pearce T. Improving the evidence base for services working with youth at-risk of involvement in the criminal justice system: developing a standardised program approach. Health Justice. 2018;6(8). Munro A, Shakeshaft A, Clifford A. The development of a healing model of care for an Indigenous drug and alcohol residential rehabilitation service: a community-based participatory research approach. Health & Justice. 2017;5(12). Shakeshaft A. Can we improve processes for engaging communitites and services in research. drug and alcohol research connections. 2018.http://www.connections.edu.au/opinion/can-we-improve-processes-engaging-communities-and-services-research. Snijder M, Calabria B, Dobbins T, Knight A, Shakeshaft A. A need for tailored programs and policies to reduce rates of alcohol-related crimes for vulnerable communities and young people: an analysis of routinely collected police data. Alcohol and Alcoholism. 2018;53:578 - 585. 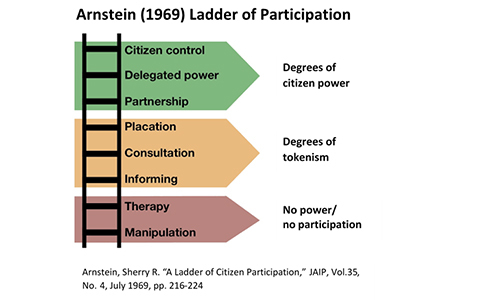 Arnstein SR. A Ladder of Citizen Participation. JAIP. 1969;35:216-224. Sackett DL, Rosenberg WMC, Muir-Gray JA, Haynes RB, Richardson WS. Evidence based medicine: what it is and what it isn't. BMJ.1996;312(71). Australian Commission on Safety and Quality in Health Care. Patient-centred care: Improving quality and safety through partnerships with patients and consumers. ACSQHC, Sydney2011.